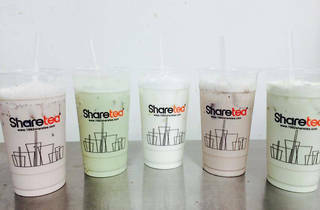 This Bay Area mini-chain delivers skillfully concocted drinks for sippers on both ends of the spectrum: tea connoisseurs and sweets-lovers. The space is small but inviting, with illustrated drink recipes adorning the mango-colored walls. The offerings span milk teas, creamas (tea topped with a whipped topping), fruit teas and brewed teas, but the most popular drinks are those that let the tea’s natural flavor shine through: Okinawa (roasted brown sugar) pearl milk tea, Hokkaido pearl milk tea, matcha red bean milk tea and black sesame milk tea—all paired with honey boba. 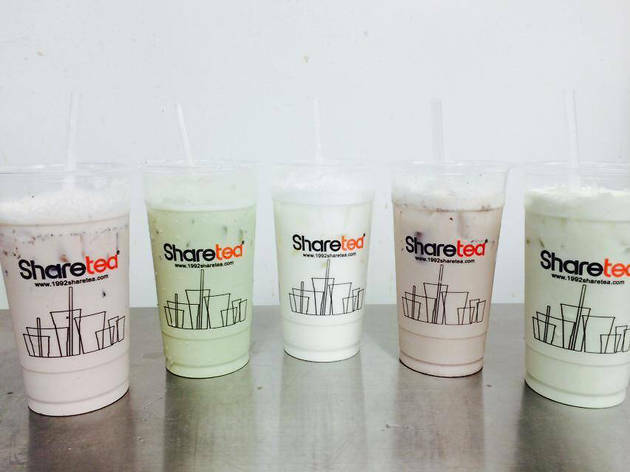 (Of course, the teenage set clamors for dessert blends like Oreo milk tea and ice cream green tea.) Toppings include jam, fruit flavoring, pudding and jelly and orders can be customized to your preferred sweetness and ice levels.